Ask just about anyone that has witnessed a family member/friend/co-worker’s health transformation–or they’ve seen documentaries like Forks Over Knives, Food Choices, and Eating You Alive–what keeps them from switching to a plant-based diet, and one of the most common answers is going to be, “I just don’t have time to cook all those complicated recipes.” I am about to show you how easy it can be with these 10 Simple Plant-Based Diet Recipes for beginners and beyond. Contrary to popular belief, eating healthy plant-based meals does not have to be difficult at all. 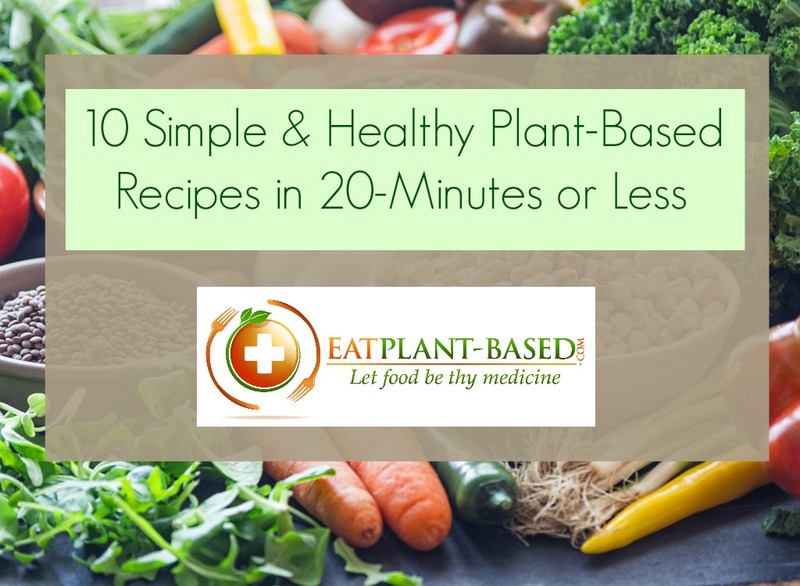 There are many simple plant-based diet recipes that can be made in just a few minutes. I completely understand long hours and crazy schedules, so let’s take a look at 10 quick and easy vegan recipes for beginners from nutrition expert, Jeff Novick, MS, RDN, LDN, that will show you just how uncomplicated it can be. Nothing fancy or complex, just simple food that will keep you from making bad decisions when you are rushed and hungry (AKA: hangry--when you are so hungry that your lack of food causes you to become angry, frustrated or both). Special thanks to Jeff Novick for graciously allowing a number of his Simple Recipes to be featured in this article. “These are examples of some of my favorite simple recipes. Most all of them can be made in about 5 minutes, have less than 5 ingredients and cost much less than 5 dollars. Jeff’s other nutrition and cooking lectures can be found on DVD by clicking HERE. Place all ingredients in a pot, bring to boil, simmer 10 minutes. 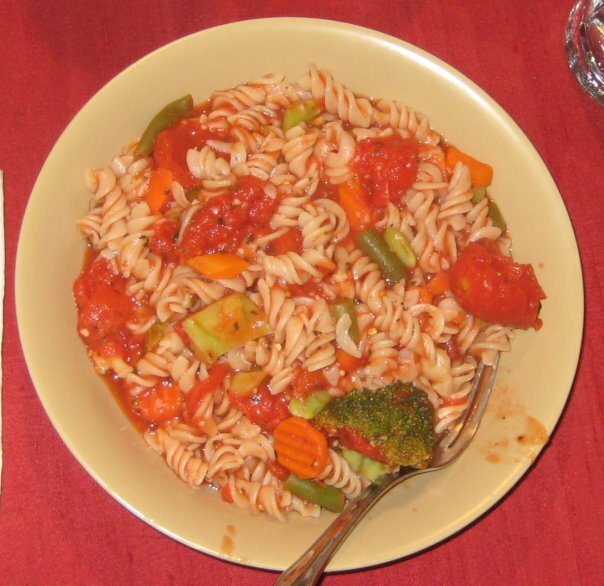 Serve over whole grain brown rice pasta, cooked according to package directions. Place all ingredients in a pot, bring to boil, simmer 10 minutes. 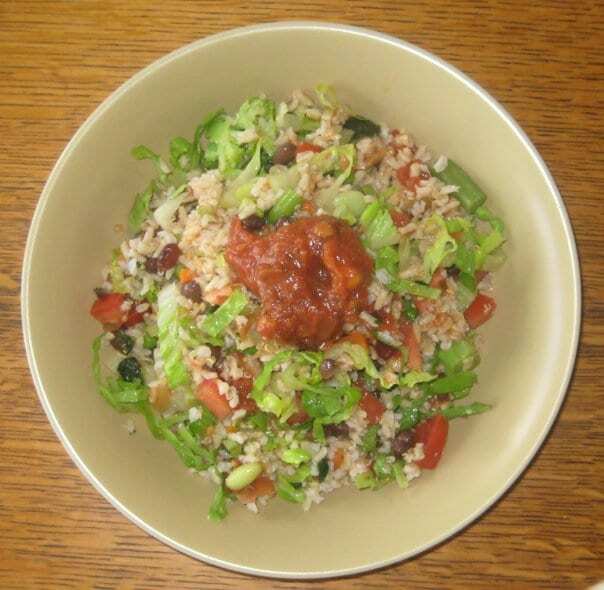 Serve over cooked long grain brown rice. Top with fresh cilantro. Place vegetables in a pot, bring to boil, simmer 10 minutes. 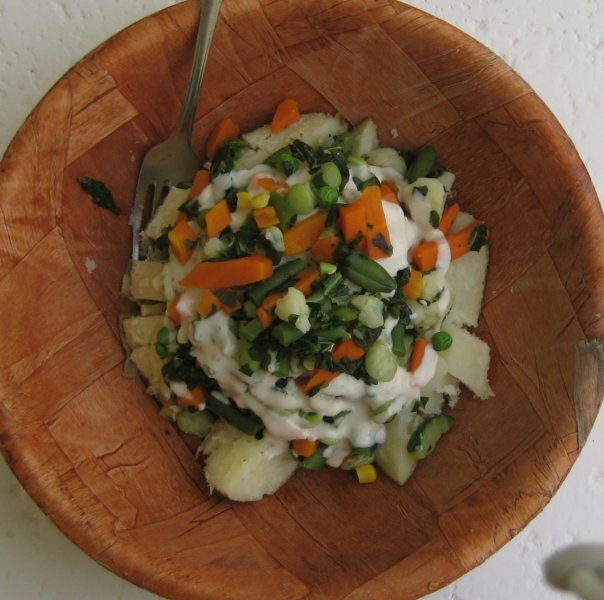 Mix sauce ingredients in a bowl and spoon over veggies. Serve over cooked baked potato. Place vegetables in a pot, bring to boil, simmer 10 minutes. Mix sauce ingredients in a bowl and spoon over veggies. 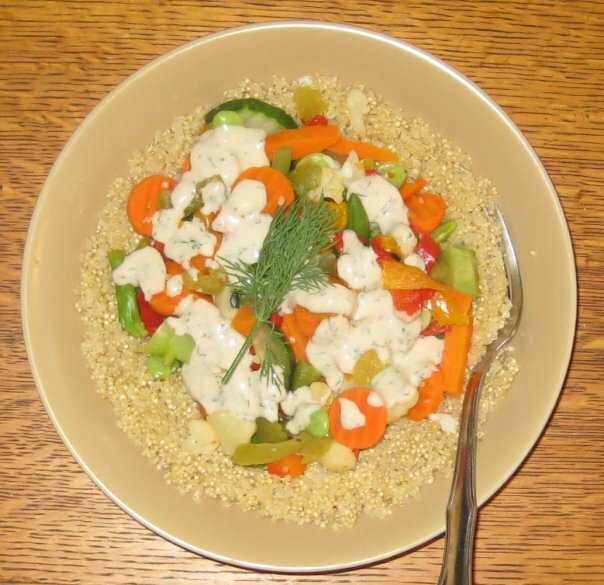 Serve over cooked quinoa made with 1 cup quinoa and 2 cups water. Place all ingredients in bowl over cooked brown rice. Serve and eat. Place vegetables in a pot, bring to boil, simmer 10 minutes. Serve over rice, and top with salsa. Mash beans by hand with a fork or potato masher. Mix in all other ingredients and form into patties. One batch will make 4-5 patties. Let sit uncovered in the fridge for 20 minutes to set. Grill or broil burgers on each side till done. Can use ~1/4 cup cornmeal instead of the oats. 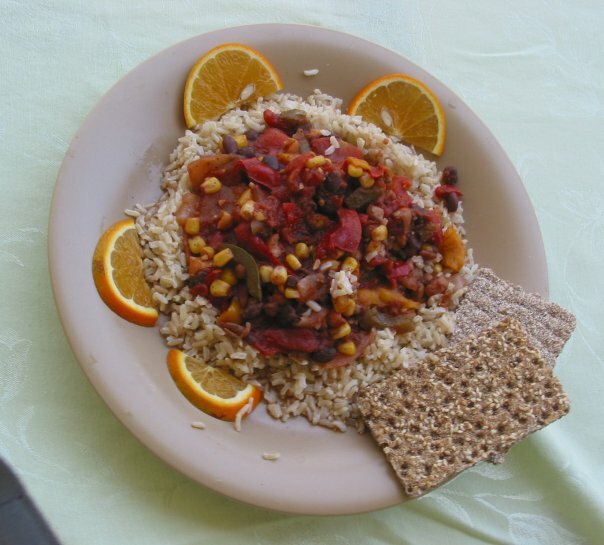 Can substitute other cooked whole grains for the cooked brown rice. – Let cool in fridge for an hour or more. While frozen soup is cooking (boil in the bags), dice potatoes and place in pot. Use enough water to cover the potatoes, bring to a boil and simmer 5 minutes. Add frozen veggies and cook a few more minutes. The boil-in-the-bag soup should be done now, so add it to the pot. Add curry powder. Stir well and serve. Cook quinoa and brown rice according to package directions and set aside. Place vegetables in a pot, bring to boil, simmer 10 minutes. Remove from heat. 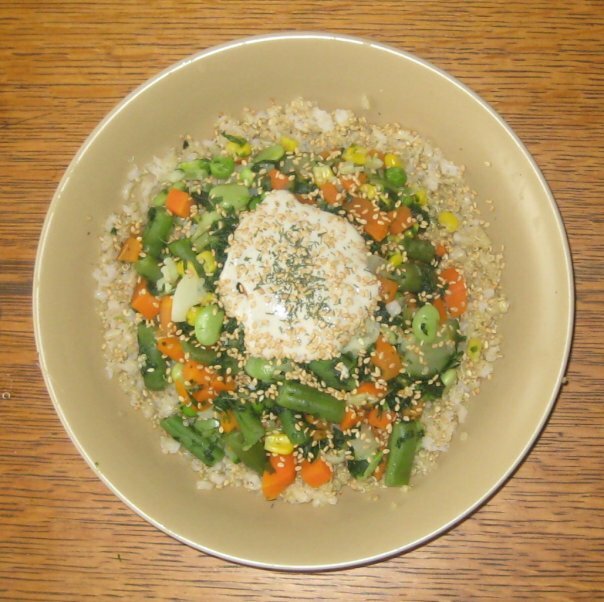 Spoon brown rice and quinoa into a bowl, add cooked vegetables. 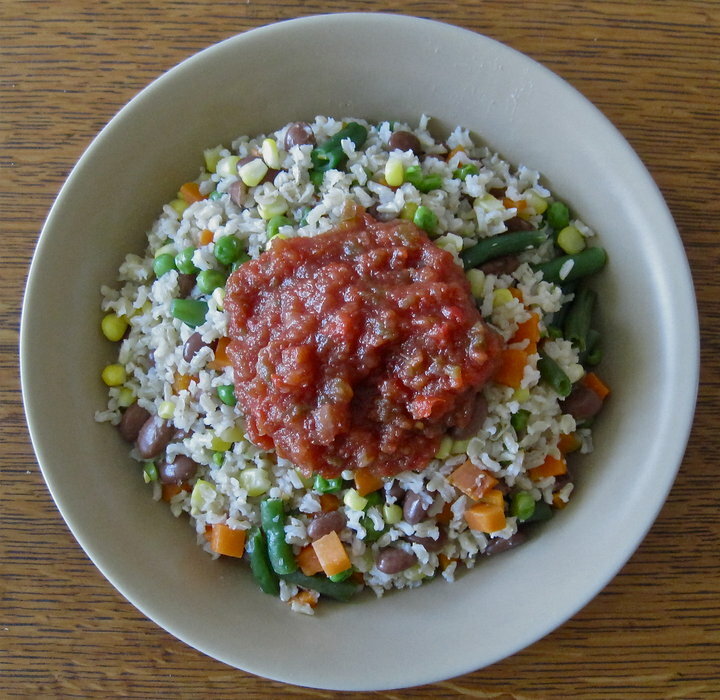 In a medium bowl, mix sauce ingredients and spoon over veggies and grains. Place ingredients in a pot, bring to boil, simmer 10 minutes. Serve immediately. The story behind Hoppin John. What’s in My Plant-Based Medicine Cabinet? I Mean Pantry! 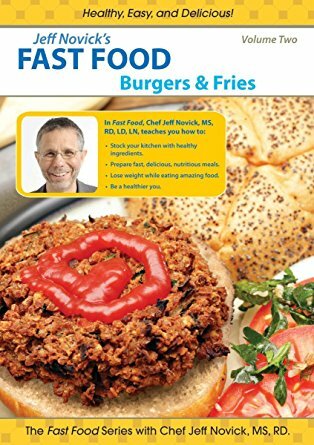 Jeff Novick, is truly a unique dietitian and nutritionist. With over 30 years of experience in nutrition, health and fitness , he offers expert health advice distilled into powerful, easy-to-understand language on a variety of current topics. His insightful and humorous approach to nutrition and health has helped thousands worldwide make the transition to healthy living. He holds both undergraduate and graduate degrees from Indiana State University in Nutrition with minors in Exercise Science. Jeff currently lectures at the McDougall Program in Santa Rosa, California. Previously, he served as Vice President of Health Promotion for Executive Health Exams International, lectured at the Engine 2 Immersion programs and served as Director of Nutrition for the Meals for Health community project, which helped empower low-income families to achieve optimal health. Jeff has also worked closely with Whole Foods Market in assisting them with the development of their Wellness Club program, their healthy eating initiatives and their food rating system. Jeff Novick has some great DVDs. Click picture to view on amazon. Affiliate Link. Links to Amazon.com are affiliate links. When you buy something through my links, I receive a commission that helps support this site which is greatly appreciated. Why do you have quiz advertisers that pretend to go along and seems like it goes with your webpage and then take you through a short quiz and then give you NON plant based recipes? There is a third-party company that handles advertisements, and unfortunately I don’t have much of any say in what they put up. I’ve even seen ads for McDonald’s and doughnuts on here before. The ads change by the minute, so different things show up all day. I haven’t seen any of the quiz ones you mentioned yet. I wish there was no need for advertisements at all, but they pay the fees required to keep my site up and free to the public. Sorry for the inconvenience, and thanks for following. I don’t believe that canned and frozen ingredients are healthy vegan. Seriously, — if you really want to eat sustainable ethical vegan then ingredients should be organic, fresh, and dishes made from scratch. I think these are OK for times you need to make a meal quickly. I’m not a real fan of frozen veggies, but I’d rather eat that than something worse I shouldn’t be eating because I’m starving. Your criticism contradicts what this list is about—quick and easy—what most people might actually tackle to lose weight and eat healthy. Frozen food is healthy—maybe not organic but so much better than what most Americans consume. What we know we should do and actually will do are not the same thing. Good grief! Give it a break! I agree, Olga, that “ingredients should be organic, fresh, and dishes made from scratch,” but the basis for the recipes is a Blue Zones-style subsistence diet, ease of cooking and clean-up, essentially with no public/private transportation required. Let’s talk about your demographics, both social and economic. well the subject of this post are meals done in 20 minutes or less. You have to cut the time somewhere. about canned vegetables, obviously fresh id always better, but canned is not that bad if you stick with low sodium and avoid added sugars. I completely agree, Olga! Once a person has made the transition to a plant based and/or vegan lifestyle I would hope that thought process would come along. However, put yourself into the shoes of a typical SAD person making the change after seeing Forks Over Knives or being introduced to Dr McDougall… They are used to quick, convenient, fast food. This type of cooking is easy to take on, really fills the belly and tastes good. Hopefully, all you speak of above comes with time and knowledge gained upon joining the community of plant based eating!!! I disagree. I don’t like canned because of the packaging and sometimes sodium content, but they are okay and necessary sometimes especially when you live in all four climates where fresh is not always available. Nothing at all wrong with frozen. Again, you can freeze what you pick from your garden and it the closest to picked fresh. 1. They are whisked from farm field to freezer much quicker than fresh vegetables make it to your fridge and table. This saves nutrients. 2. They save a lot of time, which is especially important to people with many demands on their time. 3. They avoid the problem of buying veggies, then not being able to eat them before they get old, thus helping avoid waste. 4. They are budget friendly for people who can’t afford fresh organic veggies, or who don’t live near a store that sells them. Why have I never thought of something as simple as adding broccoli to pea soup? There are some amazing ideas here that show you plant based cooking can if anything be even simpler than… that other type people insist on! 😉 Thanks for the inspiration! These recipes are an option if you are bone tired and have just enough energy to open packages and cans. It makes it possible to just keep it simple. It’s far better than stopping at a take-out on the way home. There is variety here and good pictures and many options for mix and match. Replacing the vegetables with fresh organic produce would be better. A pity these are so US-centric. What’s in the Italian blend and California blend frozen vegetables? I don’t even know what collards and turnip greens are, let alone be able to find frozen versions of them. Never heard of “steak fries”. I’d have to make my own split pea soup – it’s not possible to buy it ready made and frozen here. “frozen Deloro mixed vegetables” – what’s the difference between these and other frozen vegetable mixes? 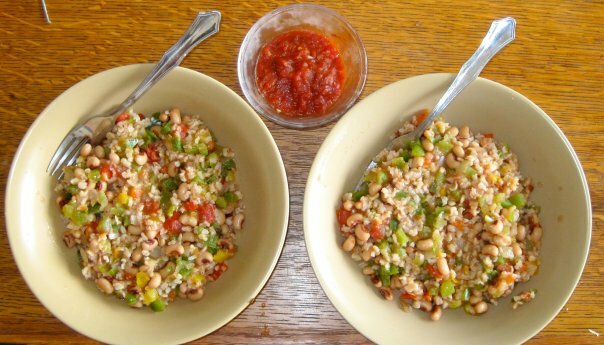 Vegan Hoppin’ John – no quantities in the recipe. My major issues with most of these recipes though is the use of packaged (frozen and canned) foods – while I appreciate they are often as healthy or even healthier than some fresh produce, the resultant waste in the form of plastic is a HUGE environmental issue. It’s disappointing that JN has put economics and speed ahead of our fragile ecosystems. Did you know every single piece of plastic that’s ever been made is still out there somewhere? Often choking rivers and oceans, killing countless birds and marine animals. With the number of supermarkets and farmers markets these days, frozen vegies is just a cop out. There’s an argument for everything. Put up the alternative. Don’t worry; someone will argue with you. Saving the planet, one frozen bag or box at a time?? Ok, then. A couple of my problems about adapting to plant-based diet are shown here. I can’t eat rice and many of the recipes are too spicy for me. I’m having a very difficult time finding recipes that I can eat. Also, I’m trying to lose weight and I’m under the care of a dietician who wants me to watch my starches and there’s never any nutritional value given with these types of recipes. As for the spices, just leave out any spices that bother you, or substitute ones that don’t. Good luck. You can do this! There are many wonderful weight loss successes on Dr McDougall’s website: http://www.drmcdougall.com. Avoiding starches is NOT the answer to weight loss. Avoiding PROCESSED carbs and animal protein and fat bring easy weight loss with the side effects of better overall health. That’s because, when you eat this way you’re getting more vitamins, minerals, phytonutrients, fiber and other nutrients than any other way, and you’re also getting all the protein you need. Starches are comfort foods that are filling and give your body what it needs. Over human history, strong cultures throughout the world have thrived on diets consisting of starchy foods such as rice, potatoes, sweet potatoes, beans and whole grains. The Chinese didn’t start becoming obese and diabetic until they began eating a more westernized diet, especially including more animal protein. By doing so, they have gone from having one of the lowest diabetes rates in the world to one of the highest in just a few years. If you will read The Blue Zones you’ll discover that the healthiest, longest-living groups of people on earth today all eat a lot of starchy foods and few animal proteins. Thanks for the great ideas for super fast meals! I’ve shared this link with my FB page “Super Quick Plant-Based Recipes” https://www.facebook.com/SuperQuickPBRecipes/ I think my members will love these AND your site! Thanks for posting these Terri. Hard to believe how petty some commenters can be. If they do not wish to use packaged foods, then don’t! I’m going to make the split pea soup tomorrow. I have a greenhouse full of broccoli, I just dug my potato crop, I have dry split peas in the pantry, and I do have a package of frozen mixed vegetables. A recipe is NOT a commandment, but rather an idea. I’ve got time so I will be cooking from scratch with fresh, local, organic, etc (except the mixed veggies). If one doesn’t have the time, toss these packaged ingredients together and enjoy. For goodness sake, LEARN how to COOK and put away the self-righteousness!